A topical antibiotic cream applied to tick bites did not perform any better than placebo in preventing Lyme disease, according to results of a randomized clinical trial conducted in Europe. The study was published in Lancet Infectious Diseases. The trial was stopped early because an improvement in the primary endpoint in the group receiving azithromycin was not reached. At 8 weeks, 11 (2%) of 505 in the azithromycin group and 11 (2%) of 490 in the placebo group had treatment failure. A subgroup analysis in this study suggested that topical azithromycin reduces erythema migrans after bites of infected ticks. The subgroup analysis was done post-hoc (after looking at the data). I won't dwell on why we shouldn't make definitive conclusions from any post-hoc analysis since the investigators themselves emphasized its exploratory nature in the Discussion of their paper. However, even if you set that aside, you'll find another problem with the post-hoc analysis if you dig into the numbers. Before I tell you what the problem is, let me first describe the study in greater detail so that you understand the issues that led to the post-hoc analysis. The subjects were adults who had been bitten by a tick within the previous 72 hours and were able to save the tick. 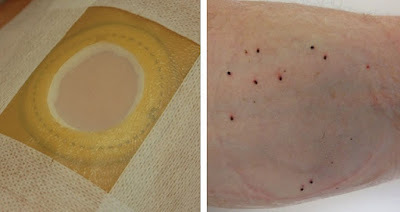 The subjects were randomized to receive a topical azithromycin cream or placebo cream. The cream was applied over the tick bite twice a day for three straight days. The patients were followed for 8 weeks. They were monitored for erythema migrans (EM), the characteristic rash of Lyme disease. Blood was drawn for serological testing at the beginning and at the end of the 8 week study period. "Treatment failure" was defined as the appearance of EM, seroconversion, or both by the end of 8 weeks. The ticks were tested for the bacteria that cause Lyme disease (Borrelia garinii, B. afzelii, and B. burgdorferi) by PCR. As I alluded to earlier, the independent committee monitoring the trial recommended that the investigators stop recruiting new subjects. Among the patients who already completed the study, the group receiving azithromycin did not fare any better than the placebo group, and recruiting more patients to the study was unlikely to change the conclusion. I provided the numbers above, but you can also find them in the table below ("ITT population," first row of data). The researchers also did a pre-planned subanalysis with the per-protocol group, an idealized situation to directly test the question, "Does topical azithromycin prevent Lyme disease in those who are bitten by an infected tick?". Patients bitten by a PCR-negative tick were excluded from the subanalysis. The small number of patients who failed to follow or complete the study protocol were also excluded. Again, azithromycin was not any better than placebo in preventing EM or seroconversion (see table, "Per-protocol population"). Treatment failure was observed in 5% (3/62) of the azithromycin group and 7% (5/72) of the placebo group (P = 0.34). 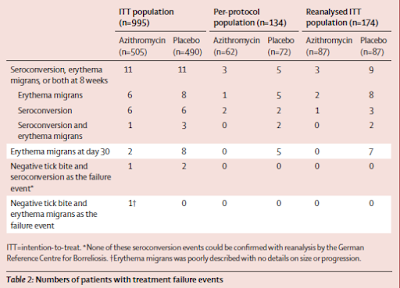 The researchers could have stopped the analysis there and write up the study, but the monitoring committee pointed out that none of the patients in the azithromycin group had erythema migrans by day 30 whereas five in the placebo group did. The committee suggested that the investigators do a post-hoc subgroup analysis using a modified definition of treatment failure as EM by 30 days. Seroconversion was removed from the modified definition. Looking at the numbers in the table ("Reanalyzed ITT population"), we now see where the news media got their numbers. No one in the azithromycin group (0/87, 0%) had EM by day 30, but seven in the placebo group (7/87, 8%) did. The difference was statiscially significant (absolute risk reduction in those receiving azithromycin: 8.05%, 95% CI 1.18-14.91). So, it's true that azithromycin prevented Lyme disease in all who were bitten by an infected tick - but only if you ignored the two patients who came down with EM after day 30 and a third patient who seroconverted. This is why I'm so baffled by the lead author's quote, which I will repeat: "None of the test subjects went on to develop Lyme borreiosis." I'm guessing that the two patients with delayed EM would disagree. Thiamine, or vitamin B1, is vital for the survival of all living things. One of the biologically functional forms of thiamine, thiamine pyrophosphate (TPP), is essential for the catalytic activity of several critical metabolic enzymes. For this reason, we must get thiamine from the food that we eat (or the vitamin pills that we swallow). Microbes obtain the vitamin from their surroundings, but many can also make their own thiamine if it's not available. It turns out that the Lyme disease spirochete Borrelia burgdorferi does not need thiamine, as described by Zhang and colleagues in Nature Microbiology . The B. burgdorferi genome lacks the genes encoding the dedicated transporters that bring thiamine into the cell. The genes encoding the enzymes that produce thiamine are also absent. Chemical analysis of B. burgdorferi by HPLC failed to detect thiamine or TPP. Despite lacking the means to make or acquire thiamine, B. burgdorferi grew just fine in culture medium devoid of thiamine. The researchers conducted stringent tests to verify that B. burgdorferi could live without thiamine. To remove all traces of thiamine, they introduced the bcmE gene from Clostridium botulinum into the spirochete. The bcmE gene encodes an enzyme that rapidly breaks down thiamine. In culture, the spirochete grew at the same rate whether or not it had bcmE. The bcmE gene did not affect B. burgdorferi's ability to infect mice or to survive in feeding Ixodes scapularis ticks. The results of these experiments provided strong evidence that B. burgdorferi doesn't need thiamine to infect the tick vector or mouse. How does B. burgdorferi manage to live without thiamine? 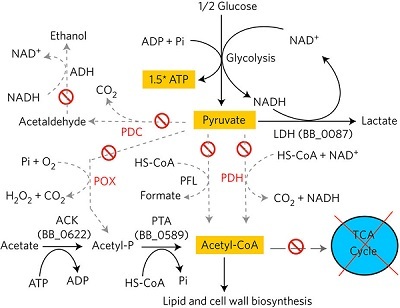 It can do without most of the enzymes that require the TPP coenzyme, but it's less obvious how B. burgdorferi copes without pyruvate dehydrogenase (PDH), a TPP-dependent enzyme that converts pyruvate to acetyl-CoA (see figure). Acetyl-CoA is an essential precursor to the bacterial cell wall, something that B. burgdorferi obviously needs. The researchers proposed that B. burgdorferi makes acetyl-CoA by an alternative pathway that starts with acetate. B. burgdorferi possesses the enzymes acetate kinase (ACK) and phosphate acetyltransferase (PTA), which convert acetate to acetyl-CoA (see figure). Figure 4 from Zhang et al., 2016. Enzymes in red (PDC, PDH, and POX) require the TPP coenzyme. Metabolic pathways found in other bacteria but missing in B. burgdorferi are shown with dashed lines. B. burgdorferi may not be alone in living without thiamine. The researchers also looked at the genomes of other bacterial pathogens that are transmitted by arthropods. Borrelia hermsii (relapsing fever), Rickettsia prowazekii (epidemic typhus), and R. conorii (Mediterranean spotted fever) were missing the genes for thiamine biosynthesis and the enzymes that use thiamine pyrophosphate as a coenzyme. The presence of the alternative pathway to acetyl-CoA synthesis assumes that acetate is available in the microenvironment surrounding the arthropod-borne pathogen. According to measurements presented in a 2010 paper, acetate is present in the midgut of fed I. scapularis ticks and in mouse blood. The B. burgdorferi protein BBA34 may be a transporter that brings acetate into the cell. Are NETs involved in fighting Leptospira interrogans infections? Neutrophils are the most abundant white blood cells in the bloodstream. As the first immune cells to be recruited to infected tissues, they play a key role in the fighting microbial intruders. It's long been known that they engulf microbes by phagocytosis, which results in the microbes being imprisoned within phagosomes inside the neutrophil. Deadly proteases, antimicrobial proteins, and reactive oxygen species are released into the phagosome to kill the microbes. Another means used by neutrophils to kill microbes was discovered just a decade ago. When mixed with bacteria, neutrophils cast nets of DNA impregnated with antimicrobial proteins to trap and kill the bacteria. The web-like DNA goes by the name "neutrophil extracellular trap" (NET). 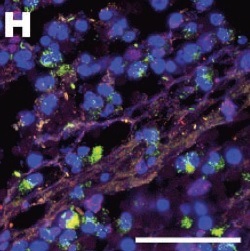 Several bacteria are known to trigger neutrophils to cast NETs, and NETs have even been observed by microscopy within infected tissues. Fluorescence staining of a neutrophil exudate in an appendicitis case. NETs are the fibrous material. Figure 4H from Brinkmann et al., 2004. Bar = 50 μm. A study published last year in PLOS NTD showed that the spirochete Leptospira interrogans is also killed by NETs. 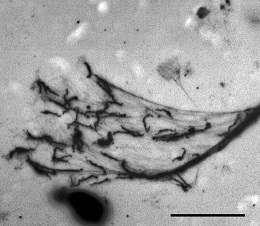 The image below shows the spirochetes trapped in a NET cast by a human neutrophil. Human neutrophils were cultured with L. interrogans for 3 hours. Figure 1A from Scharrig et al., 2015. Bar = 50 μm. The real question is whether NETs are involved in killing L. interrogans during infection. To answer this question, the investigators turned to the mouse model of leptospirosis. They found that the number of spirochetes in the bloodstream more than doubled when the neutrophils in the mice were depleted by injection of a monoclonal antibody targeting a antigen located on the neutrophil surface. Later in the infection, there was 10-fold more spirochetes in the kidneys of mice whose neutrophils were depleted than in those with normal numbers of neutrophils. This confirmed that neutrophils were involved in limiting infections by L. interrogans, but did the neutrophils fight the infection by casting NETs? The investigators used an indirect method to measure the amount of NETs generated during infection. Neutrophils often expel nuclear DNA in the form of nucleosomes to generate NETs. (Nucleosomes are assembled by wrapping nuclear DNA around histones.) For this reason, the investigators measured the levels of free nucleosomes in the bloodstream of infected mice by ELISA. They concluded that NETs were generated by neutrophils in the bloodstream because they detected free nucleosomes in blood drawn from infected mice. Much less was detected when neutrophils were first depleted with the anti-neutrophil antibody, confirming that the main source of free nucleosomes was neutrophils. These results don't convince me that NETs are generated by neutrophils during L. interrogans infection. There could be other reasons for free nucleosomes being present in the bloodstream. For example, nucleosomes could be released from neutrophils simply dying from their battle against L. interrogans. More convincing evidence would be direct observation of NETs in infected animals, as done in this study of mice with E. coli blood infections. We've seen that live Borrelia burgdorferi persists (in unculturable form) when infected mice are treated with antibiotics. What we don't know is whether they persist in humans with post-treatment Lyme disease syndrome (PTLDS), which refers to the lingering long-term symptoms experienced by a minority of Lyme disease patients who have been treated with the standard course of antibiotics. In theory, one could simply determine whether B. burgdorferi can be detected in bits of tissue or blood extracted from volunteers with post-treatment symptoms. This is what was done in the mouse studies that I described in my previous post. It's easy to culture B. burgdorferi from untreated mice that have been infected for a long time. However, humans are not mice. Except in those with Lyme arthritis, the spirochete is hard to detect by culture or PCR in patients at later stages of Lyme disease, even in those who haven't taken antibiotics. In fact, three of the four randomized controlled retreatment trials that I keep on bringing up on this blog included attempts to detect B. burgdorferi in cerebral spinal fluid or blood of PTLDS patients by culture and PCR. No specimen was culture positive except for one, and none were PCR positive. The single positive culture turned out to be a contaminant. The rest of the scientific literature is littered with claims that Lyme Borrelia can be detected by culture or PCR in blood, urine, or CSF of treated patients. However, critics have raised several concerns about these studies. For instance, alternative explanations for the findings such as contamination or reinfection weren't ruled out. With all of this as background, Marques and colleagues decided to test a different approach – xenodiagnosis. For this procedure, uninfected ticks are deliberately placed on the skin and left for several days to give them time to take a blood meal. If there are any spirochetes in the skin nearby, they will move towards the feeding site because they are attracted to the tick's saliva. The spirochetes then get drawn into the tick's feeding tube along with the blood meal. The fed ticks are then removed and tested for the presence of B. burgdorferi. The sensitivity of xenodiagnosis can be enhanced by placing multiple ticks to increase the chance that at least one tick will drink blood containing B. burgdorferi. Xenodiagnosis is done routinely with mice in the research setting, and I mentioned in my previous post that B. burgdorferi can be detected in antibiotic-treated mice by xenodiagnosis. The first thing to do was a pilot study to make sure that the procedure was safe for volunteers. 25 subjects who had been treated for Lyme disease took part in the study. 10 of the 25 had PTLDS. Ten healthy volunteers and one subject with untreated erythema migrans (EM), the skin rash of early-stage Lyme disease, were included in the study. As for the ticks, the investigators bred and maintained Ixodes scapularis in the laboratory. The ticks were carefully screened to make sure they were free of known infectious agents. 25-30 ticks were placed on each volunteer and covered with a special dressing to keep them in place (see images below). The ticks were left alone for a week so that they could consume a blood meal. Some of the fed ticks were tested for the presence of B. burgdorferi DNA by standard PCR or by a more sensitive technique: isothermal amplification followed by PCR and mass spectrometry (IA/PCR/ESI-MS). The remaining ticks were cultured or were placed on immune-deficient mice to determine whether B. burgdorferi, if present, could be transmitted. Figure 1 from Marques et al., 2014. Left panel: ticks covered with a special dressing on forearm. Right panel: feeding ticks attached to forearm, dressing removed. So did anyone test positive by xenodiagnosis? Yes. B. burgdorferi DNA was detected in two subjects. One was the subject with untreated EM. This subject served as sort of a positive control. I say "sort of" because antibiotic therapy was started at the same time that the ticks were placed on the EM lesion – it would not have been ethical to delay treatment while the ticks were feeding. B. burgdorferi DNA was detected in two of the ten ticks tested. The subject was tested by xenodiagnosis again seven months later, and all ten ticks that were tested were negative for B. burgdorferi DNA. The other positive test came from one of the PTLDS subjects. One of the five ticks that were tested was positive for B. burgdorferi DNA. The same subject tested positive by xenodiagnosis again 8 months later: one of three ticks tested positive for B. burgdorferi DNA by IA/PCR/ESI-MS.
Of course DNA doesn't equal viability. The study didn't provide much evidence that the DNA detected in the single case of PTLDS came from spirochetes that were alive at the time that the ticks were placed. A skin biopsy taken from where the xenodiagnostic ticks were feeding was culture negative, as were the fed ticks themselves. The ticks also failed to transmit B. burgdorferi to immune-deficient mice, a process that probably requires live, motile spirochetes. To be fair, this was just a pilot study with the primary goal to assess the safety of xenodiagnosis. Nothing terrible happened to the volunteers, although half experienced mild itching at the feeding site. The investigators are recruiting additional subjects for a larger study to determine whether positive test results by xenodiagnosis are associated with post-treatment symptoms. As a follow up to my previous post, I would like to say something about several mouse studies from Stephen Barthold's group. These papers are often cited by those who believe that retreatment is needed in patients who continue to experience symptoms following treatment of Lyme disease with conventional antibiotic regimens. The assumption is that post-treatment symptoms stem from spirochetes surviving the initial antibiotic therapy. In the 2008 and 2010 studies (described in detail here and here), Barthold's group gave doxycycline, ceftriaxone, or tigecycline to mice with disseminated Borrelia burgdorferi infection. As expected, all tissues were culture negative up to three months following antibiotic therapy. Tissues from untreated mice were culture positive. However, B. burgdorferi DNA and mRNA were detected by PCR in up to half the treated mice, and microscopy revealed a few intact spirochetes in collagen-rich tissues from these mice. Ticks allowed to feed on the treated mice even transmitted the spirochetes to other mice (albeit immune deficient ones), where B. burgdorferi DNA was detected by PCR. Clearly, the spirochetes that survived antibiotic treatment were alive despite being unculturable. Although live spirochetes remained following antibiotic therapy, there was no evidence that they were capable of causing disease. Lyme disease is driven by inflammation, but no inflammatory response in the form of infiltrating immune cells were seen in tissues harboring the spirochetes. A critic of the work also pointed out that the number of spirochetes declined during the 3 months following treatment, implying that any lingering spirochetes would eventually disappear. It seemed unlikely that a similar phenomenon was responsible for persisting symptoms following treatment of Lyme disease in human patients, who may suffer with disabling symptoms for years. In 2014 Barthold's group came out with another paper, which I'm discussing here for the first time. Again, mice with disseminated B. burgdorferi infections were treated with antibiotics, ceftriaxone in this case. But this time, the mice were left for up to a year before their tissues were examined for the presence of B. burgdorferi. Control mice were mock treated with saline and examined along with the treated mice. There weren't any surprises when tissues were tested by culture. Most of the control mice were culture positive at all time points (2, 4, 8, and 12 months) with both tissues tested, the urinary bladder and the skin where B. burgdorferi was inoculated to initiate infection. None of the treated mice were culture positive at either site at any time point. PCR testing for B. burgdorferi DNA was done with tissue obtained from six sites in the mice. Ticks allowed to feed on the mice were also tested for the presence B. burgdorferi DNA by PCR in a method called xenodiagnosis. All saline-treated mice were PCR positive in most tissues tested, and most tested positive by xenodiagnosis. 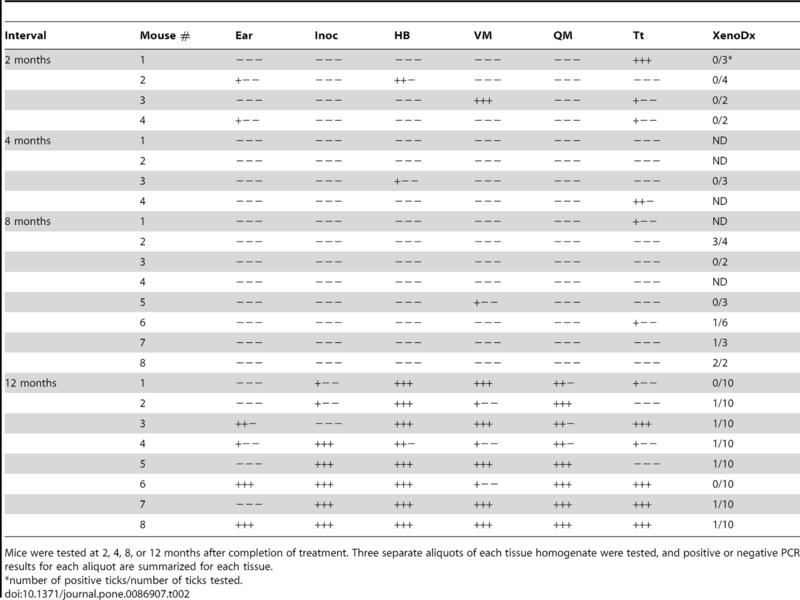 The results with the mice treated with ceftriaxone are shown in the table below. Each row represents a single mouse. Note that each tissue homogenate was tested three times. Table 2 from Hodzic et al., 2014. "Interval" = time after completion of treatment; "Inoc" = skin from inoculation site; "HB" = heart base; "VM" = ventricular muscle; "QM" = quadriceps muscle; "Tt" = tibiotarsus; "XenoDx" = xenodiagnostic ticks (# ticks testing positive/# ticks placed on mouse). They saw something remarkable with the mice left for 12 months. Although few tissues were positive at earlier time points, most tissues extracted from mice a year after treatment tested positive. 6 of the 8 mice also tested positive by xenodiagnosis. So, instead of eventually disappearing, the spirochetes proliferated starting at some point after 8 months elapsed following treatment. This resurgence occurred even though the spirochetes remained unculturable. Barthold's group also looked for evidence of inflammation. Despite the resurgence of spirochetes, they did not see much evidence of inflammation by microscopy of the tissues 12 months following antibiotic treatment. However, the researchers pointed out that no conclusions can be drawn about the ability of the persisting spirochetes to cause disease since inflammation was minimal even in saline-treated mice, which harbored culturable spirochetes. The researchers next looked for molecular evidence of inflammation. They measured transcript levels of 18 cytokines in the base of the heart, heart muscle, quadriceps muscle, and leg joint 12 months after treatment with ceftriaxone or saline. The levels of cytokine transcripts in the two groups were compared to those in age-matched uninfected mice. Not surprisingly, saline-treated mice had what the authors deemed a "proinflammatory" cytokine profile, most likely due to their ongoing infection. Antibiotic-treated mice also had a proinflammatory cytokine profile, although it differed from that of the saline-treated mice. This observation is the first to suggest that the mice were responding to persisting spirochetes that survived antibiotic treatment. In conclusion, the evidence is convincing that B. burgdorferi persists in mice for a long time after antibiotic treatment. They don't eventually disappear and may even proliferate. Whether these unculturable spirochetes are capable of generating an inflammatory condition necessary for disease is less clear, though mice do appear to generate a unique cytokine profile in response to the persisting spirochetes. Because of the controversial nature of these findings, they should not be over-interpreted and certainly not translated directly into clinical management of human Lyme borreliosis. So is there any relevance of these findings to post-treatment symptoms in humans? I will touch upon this issue in a future post. Chronic Lyme disease in mice?